Generics and Biosimilars Initiative Journal (GaBI Journal). 2018;7(1):29-34. Although small molecule drugs still dominate the global pharmaceutical market in terms of numbers, biologicals are making a significant dent. However, the high cost of biologicals is putting increasing pressure on healthcare budgets, thus opening the door to biosimilars. With patents on originator biologicals expiring, biosimilars are expected to take an increasing share of the biologicals market. 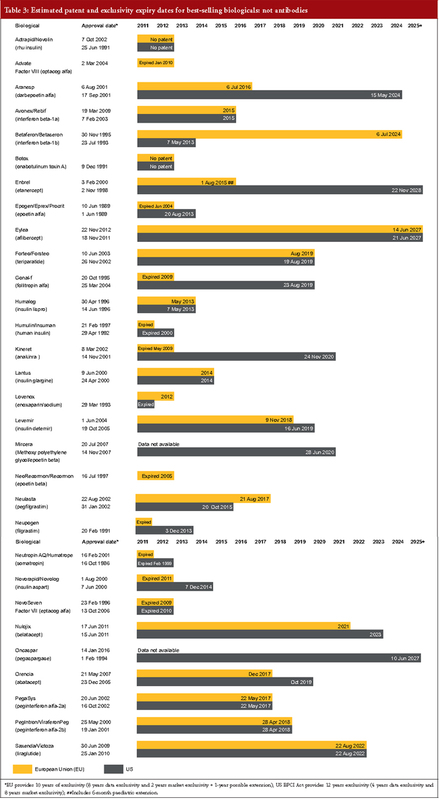 In light of these facts, this paper gives estimated patent expiry dates for some of the best-selling biologicals. Biologicals are making up an ever-increasing share of the pharmaceutical market. Biologicals dominate the top 10 list of best-selling medicines in Europe, with seven of the top 10 best-selling drugs being biologicals in 2017. This compares to only three biologicals that made the top 10 list back in 2008 . Although biologicals represent many of the most promising new therapies for previously intractable diseases, they are extremely expensive , putting pressure on healthcare budgets. One way to offset these costs is to introduce biosimilars for biologicals where the patents and exclusivity periods have expired. The European Medicines Agency (EMA) approved its first biosimilar Omnitrope (somatropin) back in 2006 . Since then, EMA has approved 38 biosimilars within the product classes of human growth hormone (HGH), granulocyte colony-stimulating factor (G-CSF), erythropoiesis-stimulating agent (ESA), insulin, follicle-stimulating hormone (FSH), parathyroid hormone, tumour necrosis factor (TNF)-inhibitor and monoclonal antibody, for use in the European Union (EU) . The price of new biologicals is increasing fast. For example, eight cancer medicines approved by the US Food and Drug Administration (FDA) in 2015 had six-figure price tags . One way to combat these increasing costs is to introduce biosimilars. By 2018, biologicals worth more than US$68 billion in current annual sales will lose patent protection, making the case for using biosimilars clear. Even with only a 20% discount, this could give the world a US$14 billion health innovation fund. Whereas, a 30% discount could save US$20 billion and a 40% discount could save US$27 billion . There has been significant harmonization across the globe with respect to patents, mainly as a result of the World Trade Organization’s TRIPS agreement (agreement on Trade-Related Aspects of Intellectual Property Rights). This has resulted in most patent laws nowadays, giving the term of a patent as 20 years from the filing date of the application. This is the case both in Europe and the US, where patents have a term of 20 years from the date of filing . For both Europe and the US exclusivity periods should also be considered, see footnote of Tables 1, 2 and 3. 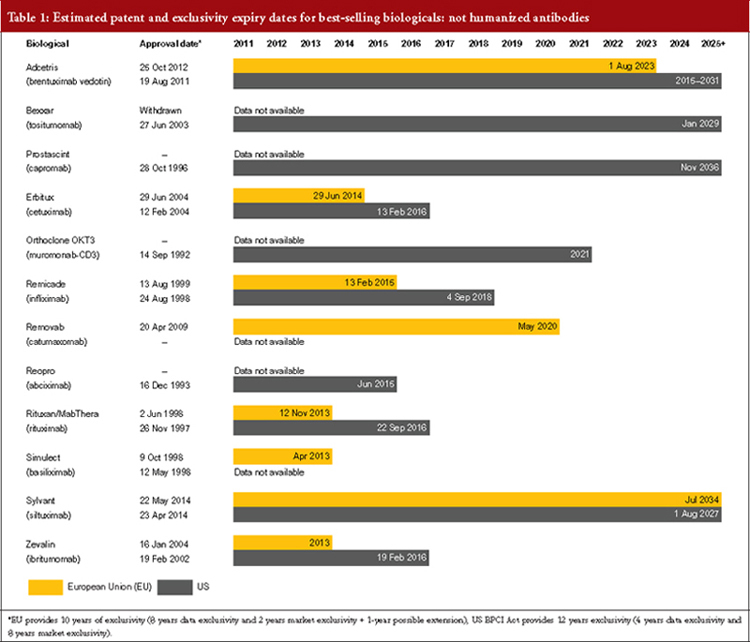 Estimated patent and exclusivity period expiry dates for some of the best-selling biological molecules are shown in Tables 1, 2 and 3 for not humanized antibodies, humanized antibodies and biologicals that are not antibodies. Ten years if the reference product is centrally approved or application to the centralized procedure has been made before 20 November 2005. Or eight years data exclusivity + 2 years market exclusivity + 1 year possible extension if a full dossier is submitted on or after 30 October 2005 via a national procedure or after 20 November 2005 via the centralized procedure . The expiration of patents and other intellectual property rights for originator biologicals over the next decade opens up opportunities for biosimilars to enter the market and increase industry competition. Price reduction strategies should increase adoption among physicians and patients alike, spurring increases in the biosimilars market share. According to a report by MarketsandMarkets the global market for biosimilars is expected to be worth US$10.9 billion by 2021. This represents a compound annual growth rate (CAGR) of 26.3%, increasing from US$3.39 billion in 2016. Geographically, the biosimilars market is dominated by Europe, followed by Asia, North America, and the Rest of the World. Growth in Europe is primarily driven by the need to curtail healthcare costs, patent expiry of biologicals and the arrival of new biosimilars, rising incidence of chronic disorders such as cancer, diabetes and rheumatoid arthritis, and the emergence of new market participants. However, the Asian market is projected to grow at the highest CAGR. Although the US is the largest biologicals market globally, it is still playing catch up when it comes to biosimilars. EMA approved its first biosimilar back in 2006 and has now approved more than 38 biosimilars . In contrast, the US Food and Drug Administration (FDA) only approved its first biosimilar in 2015 and to date (December 2017) has approved only nine biosimilars and two follow-on biologicals . The EU, however, is not without its problems. Uptake of biosimilars varies significantly between the different countries of the EU, with some, such as Italy and Spain, having quite low biosimilars use compared to countries where there is high acceptance of biosimilars, e.g. Austria, Germany, The Netherlands and Sweden . In fact, many countries appear to be struggling to find the most appropriate approach to encourage the use of biosimilars . However, favourable clinical outcomes demonstrated through clinical trials of biosimilars are expected to increase confidence and boost uptake of biosimilars. In fact, positive data on switching has already been demonstrated in the results of several trials comparing originator and biosimilar infliximab [9–11]. In addition, results of the NOR-SWITCH study suggest that patients can safely be switched between originator and biosimilar infliximab . In addition, lessons learnt from the launch of Zarxio in the US point to aggressive price discounts in markets with multiple biosimilar entrants. As the landscape evolves, biosimilars will get favoured tier coverage and/or formulary exclusivity from payers as manufacturers increase rebates. In addition, early biosimilar market entrants need to invest in their brand to gain buy-in from key stakeholders . Key players in the biosimilars market include Amgen, Apotex, Biocon, Boehringer Ingelheim, Celltrion, Dr Reddy’s, Eli Lilly, Fuji Pharma, Merck, Samsung Bioepis, Pfizer, Sandoz, Teva Pharmaceuticals and more.